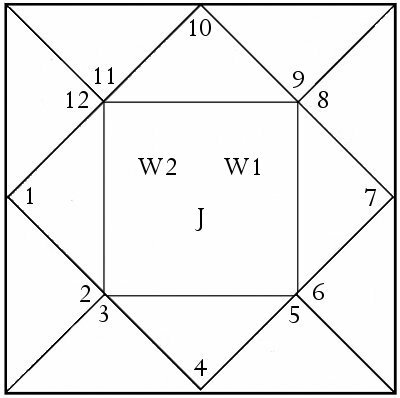 Western Geomancy from Serena's Guide to Divination and Fortune Telling. The art of geomancy was known in ancient Greek and Roman times, however, we do not know exactly how it was performed or interpreted. What information we do have comes to us from the Middle Ages, and this is what is set out below. The main knowledge of geomancy came to Europe via Arabic texts in the 12th century in Spain, and from there spread across Europe. Its origins may be either Persian or Arabic. The Byzantines also called it Rabolion or Ramplion. The Arabs brought geomancy to Africa and variations of it can today be found practised all over Africa. In North Africa it has developed into Afa (Afá in Mina, Fa in Fon) and Ifa in Nigeria (Ifá in Yoruba). In Madagascar, geomancy developed into an interesting variant called Sikidy. In India it is called Ramal Shastra. Although geomancy has been popular for millennia around the world, in the Western world it was widely practised during the Middle Ages and the Renaissance but then its popularity died down until a recent small resurgence in interest. An offshoot of geomancy became Napoleon's Book of Fate. Many see this form of divination as too "simplistic" but its outward simplicity belies the depth of the answers it gives. Some use it to derive a single figure as an answer. Others prefer to combine it with astrology. Each figure has an association with a planet and an astrological sign. The figures are placed within a square Medieval astrological chart and interpreted according to which houses they fall in. This chart is sometimes called a "theme". The figure is usually represented using centered points (dots on paper, holes in the sand). However there are some historical variations. In Medieval times, the dots were sometimes printed justified to the right which looks very disconcerting when you are not used to seeing them this way. Especially if you associate a mnemonic image with the figure, for example, two cups for Acqusitio (below). Arabic geomancers often wrote a line in place of two dots, as is used in Arabic handwriting. Are you ready to consult the Oracle of the Earth? First, you need to decide on a way of getting a one/two response. Use either a Roman dice (two-sided, bone and male), a coin (Heads in one point, Tails is two points) or a randomly drawn line of dots (usually right to left in the Arabic way) which gives an either odd or even answer. In Ramal Shastra (India) four dice on a rod are used. You can also use a bag of seeds or small pebbles. With this method you grab a handful and remove the seeds two at a time from the pile until only 1 or 2 are left. To start you need four one/two answers to draw a figure. For example, a result of two, two, one, one (even, even, odd, odd) gives the figure Fortuna Major. Continue until you have four geomantic figures. These are the four Mothers or Matres. The next step is to create the four Daughters or Filiae. 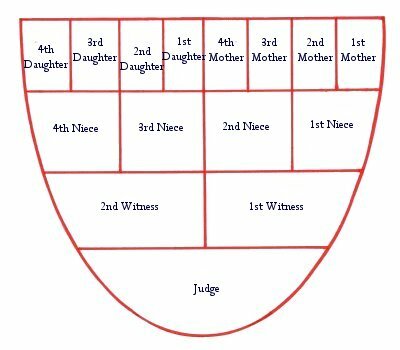 Simply use the top lines ("the heads") of each of the Mothers to create the first Daughter. For example, if the top lines of each of the Mothers is two, two, one, two, then the First Daughter will be the figure Albus, two, two, one, two. Good Judge + good Witnesses = Excellent Outcome. Bad Judge + bad Witnesses = Bad Outcome. Good Judge + bad Witnesses = Success after delays and problems. Bad Judge + good Witnesses = No real or enduring success. Go to More Advanced Geomantic Techniques including The Reconciler, The Way Of the Points, the Part of Fortune, The Projection of Points, the Qualities, the Four Triplicities, Occupation, Conjunction, Mutation, Translation, Astrological aspects, the Company of Houses, and what to do if the Reading makes no sense at all. POPULUS (THE PEOPLE) Stability. This neutral figure denotes family, friends, group involvement and generally indicates that the outcome depends on others. It can also mean messages and news as well as the environment around us. Going with the flow. FORTUNA MINOR (THE LESSER FORTUNE) Swiftness. Smaller good fortune, assistance from others, influence, protection from misfortune and harm. Abuse of power. You may have to work hard but success is yours. Change and instability. Quick outcome. CAUDA DRACONIS (DRAGON'S TAIL) Ending. An exit, a way out. Bad luck, a downward path, death and endings. Evil. You need to walk away from something and start anew. Good in all that is evil, and evil in all that is good. Illusion, fraud, deception. 1st House Vita Life The querent. Personal life and appearance, beginnings, accidents, new projects, length of life. East. Angular. 2nd House Lucrum Riches Finances, values, lost or stolen objects, possessions, potential poverty or wealth, resources, material things desired, business transactions, earnings (work). East North-East. Succedent. 3rd House Fratres Brothers Siblings, relatives, neighbours. Short journeys. Schooling, early education. Cars. Personal communication, letters, emails, advice. Gossip, rumours, news. North North-East. Cadent. 4th House Genitor Father Home, parents, father, domestic issues, buried treasure, land, real estate, inheritances from parents, houses, farms, agriculture, old age, mines. The end of any matter. North. Angular. 5th House Nati Sons Children, women, luxury, affairs, gambling, hobbies, stocks, romance, pregnancy, elections, entertainment, feasts, eating, drinking, parties, fun. Personal creativity. Bodies of water, rain. Teaching. North North-west. Succedent. 6th House Valetudo Health Health, illness, diseases, injuries, misfortunes. Hygiene, healing. Daily work, daily routines. Pets, small animals. Servants, employees. West North-west. Cadent. 7th House Uxor Wife Partner (marriage and business), lover. Divorce, lawsuits, contracts. Quarrels, open rivals, competitors. Thieves, robbers, dishonours. Any unidentified person. The astrologer. West. Angular. 8th House Mors Death Shared resources, death, birth. Surgery. Transformations, occult. Taxes, debts, mortgages and loans. Legacies, inheritance from other than parents, other people's money or resources, corporate money. Investigations. Poverty, suffering, dangers. Sleep. West South-West. Succedent. 9th House Itineris Journeys Long-distance travel, religion, philosophy, education, learning, religion. Lawyers, professionals. Dreams, divination. Wisdom. The arts. Public communication, media, publishing. South South-West. Cadent. 10th House Regnum Kingdom Career, calling. Mother. Superiors, authority, employer, ruler. Status, fortune, success, glory, reputation, honours. Environment, the weather. South. Angular. 11th House Benefacta Good Fortune Friends, sources of help. Protection, riches, presents. good fortune, Joy, hopes and wishes, praise, confidence, goals. Social activities, group endeavours. South South-East. Succedent. 12th House Carcer Prison Loss, imprisonment, secret enemies. REtreat and solitude. Widowhood, fears. Secrets, suffering, afflictions. Large animals. Hidden life, unconscious thoughts. Institutions, hospitalisation. Suicide, murder. Vagabonds, prostitues, beggars. Charity. Drugs and alcohol. South South-West. Cadent.